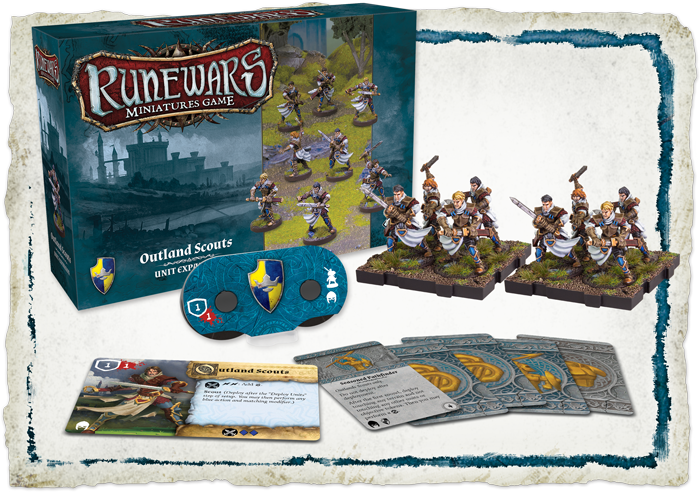 Outland Scouts Unit Expansion for Runewars being Released Soon! Fantasy Flight Games is pleased to announce the upcoming release the Outland Scouts Unit Expansion for the Daqan of Runewars Miniatures Game!! Among the distant villages across the back country of Terrinoth, and in the untamed woods that separate the baronies, men and women rise to meet the call of the Daqan and do their part to hold the line against the rising darkness. These simple folk rarely join the regimented ranks of spearmen or knights, but many isolated hamlets owe their continued existence to the vigilance of these scouts, who stamp out small dangers without ever being seen or rally garrisons to fend off larger threats. As dangers grow in the East, the lords of Terrinoth’s baronies must call in their forces from even the most distant villages. The Outland Scouts Unit Expansion includes eight figurines and two Plastic Infantry Trays to house them, as well as a collection of tokens and five available upgrade cards to strengthen your Daqan forces.